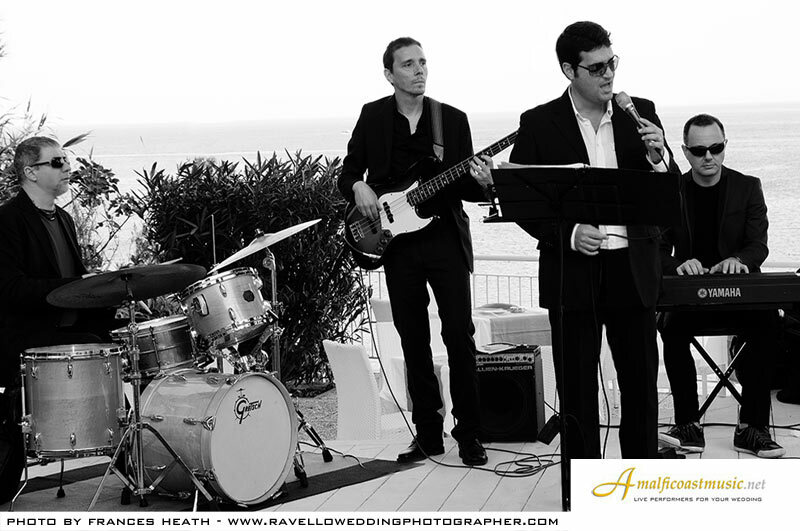 and how to book your wedding music in Ravello and on the Amalfi coast in Italy please read on. 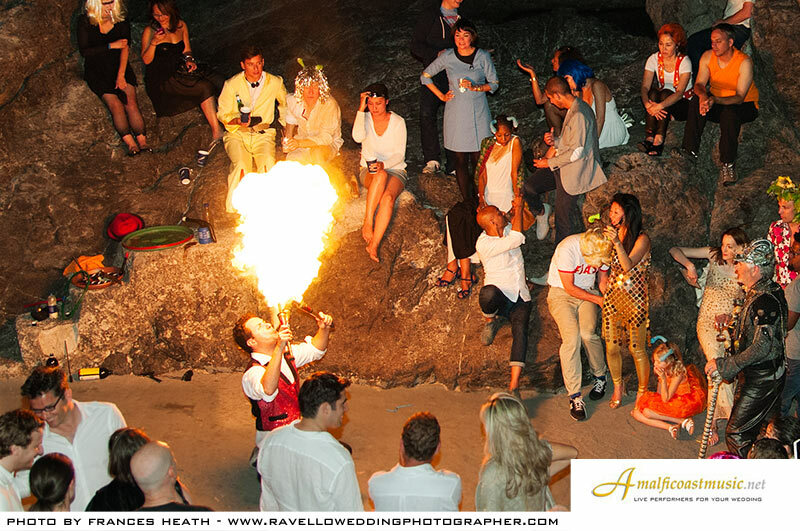 PLEASE NOTE: our performers and services can only be booked directly by the bride and groom through this website. If you want to get everyone dancing with a live band that performs all the POP hits everyone loves, such as Maroon 5, Bruno Mars, Pharrell and many more, this is the band for you. POP cover band performing the latest and most popular hits. This is a fun & dance band available as a fully live act, or as a live trio + professional backing to add drums and back vocals. If you're looking for a Sinatra style big band, or for a jazz band with a broad repertoire, this is the place. These acts are ideal for dinner, and if you'd like to dance to some swing that can surely be arranged. This was filmed at the ruins of Sant'Eustachio near Ravello, one of the most spectacular ceremony locations on the Amalfi coast. You can see rehearsal first and then the actual performance. 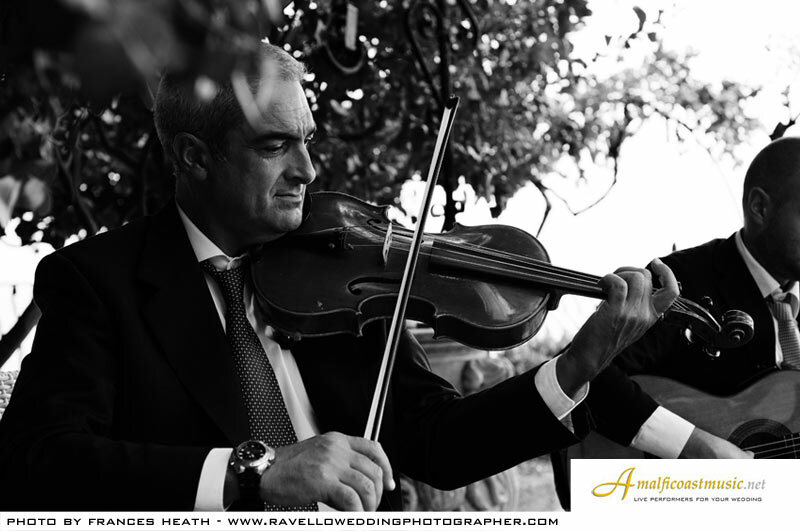 Our Neapolitan band will give your reception that typical lively southern Italian touch in an elegant and understated way. This performance was filmed at the Belmond Caruso. 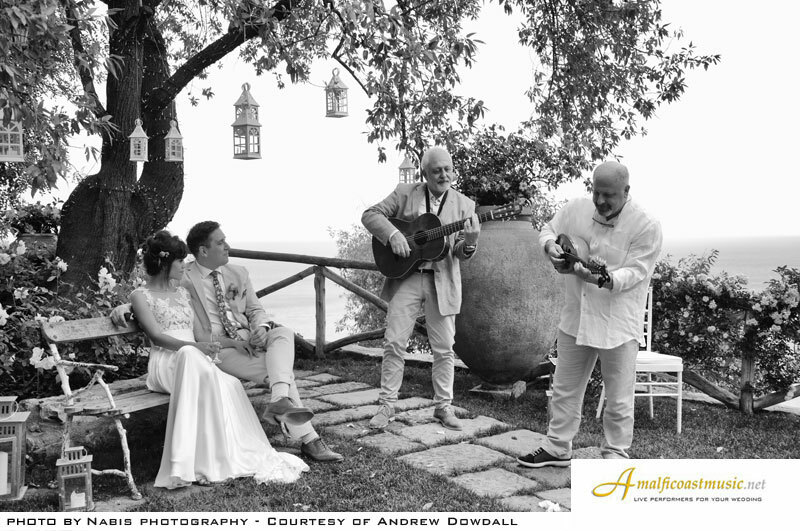 Lindsey & Spencer's wedding music featured guitar and violin for ceremony at the Duomo, and guitar and mandolin for a fun walk to Cimbrone, acoustic quartet, traditional dancers and a great DJ set. Gloria and William eloped in Villa Cimbrone in Ravello. 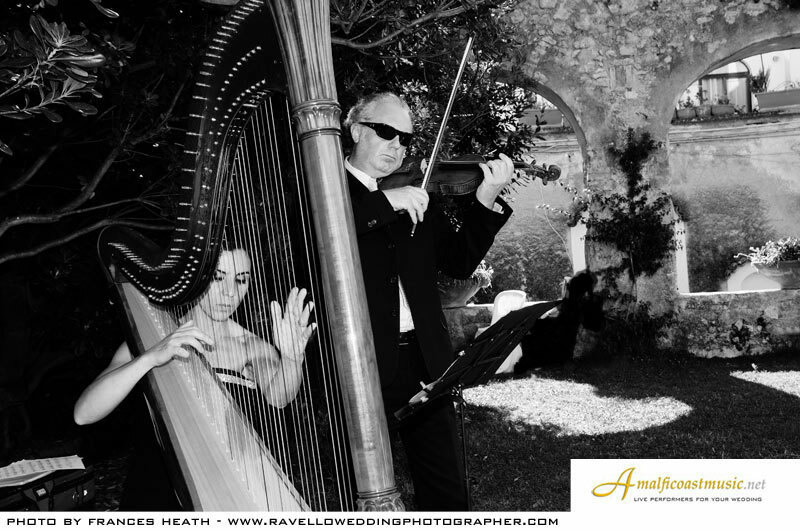 Their wedding music featured harp and strings for ceremony in the gardens, and a very romantic dinner in the ancient cloisters. Raffaella & Anthony had their reception at the Belmond Caruso. They chose acoustic music for dinner at the Wagner gardens, and a fun DJ set based on Reggaeton and old-school dance hits. Omari & Victoria's Wedding Music :. The best day of our lives was made even more memorable by Bruno and Amalfi Coast Music. The playlist he choreographed was a perfect mix for our family. So much so our entire family started to dance during our dinner! It was one of the most memorable times of the evening. Bruno was engaging, attentive and professional throughout the planning meetings and the entire evening. Our sincerest thank you to Bruno and what he was able to do for our day, we are forever grateful. There are no other options when planning any sort of event in the Amalfi Coast region, Bruno and his team are simply the best. He is a perfect complement to any event you are planning, and will exceed all of your expectations. Thanks again Bruno! Augusto & Fernanda's Wedding Music :. 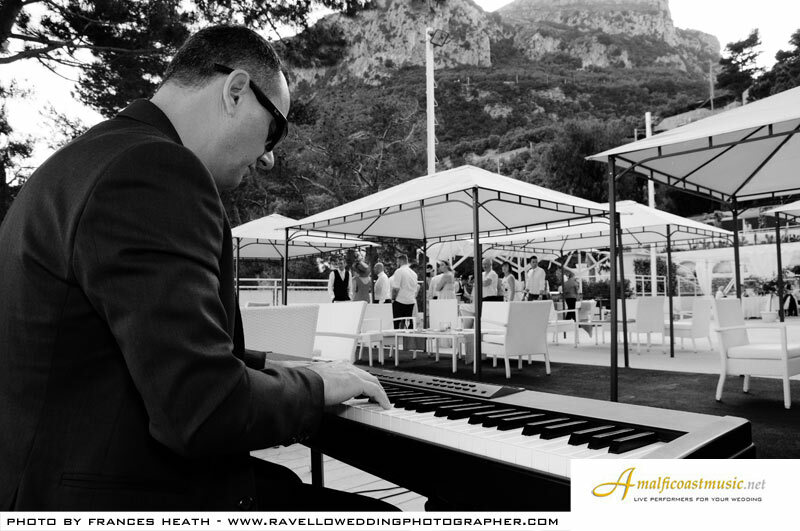 We had our wedding at Hotel Palumbo in Ravello in September and after a long search for someone that could provide us the music service we found Bruno. He was extremely prompt at answering our emails and very easy to work with during the arrangements. But we still felt a little worried and anxious, after all we were having a wedding in a different country and we were doing all of the planning over the internet. Bruno turned out to be one of the best professionals I've worked with and also an amazing person. All I have to say is that everything was absolutely perfect. All the musicians were great and the music was able to fully entertain and satisfy every guest. The ceremony musicians were great and we had so much fun with the songs played until the end of the night. I cannot thank Bruno enough for all of this and I would recommend him to everyone wishing to have a perfect wedding on the Amalfi Coast. Colin & Carly's Wedding Music :. 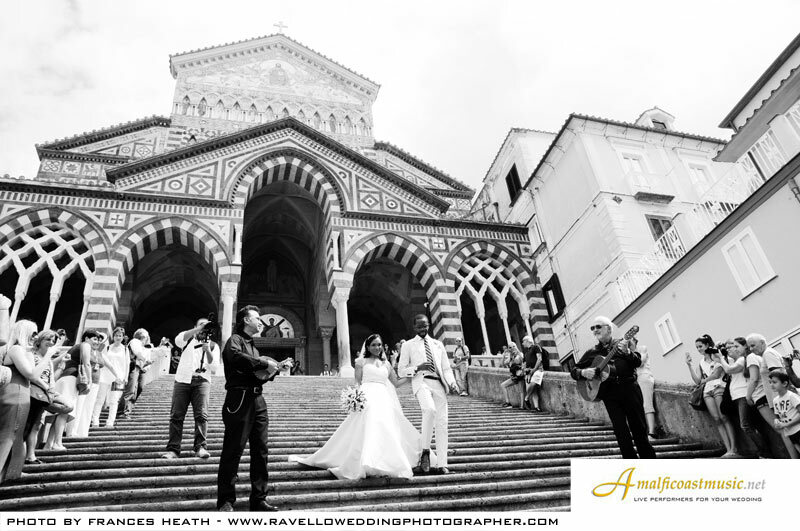 My wife and I celebrated our marriage in Ravello in July. Living in Australia we plotted this great step through internet searches. How fortunate we were to find Bruno, ... being able to book all of our music needs through Bruno was a huge bonus. Our wedding day was enriched with three authentic acts and DJ; guitar and violin who brought a tear to most in the church, the Neapolitan duo who joined us on our walk from Santa Maria a Gradillo Church to Piazza Duomo and later on to our reception ... Bruno (vocals) and Stefano (saxophone) delivered some jazz and swing classics, giving us an appetite for the dance floor later in the evening. Bruno took to the decks and pumped out tunes past our agreed time. Our playlist was specific and diverse, posing no problem for Bruno who was more than happy to play our requested music ... Without hesitation we would recommend Bruno ... All our music requests were served up in a professional and gracious manner. Kayleigh and Michael's Wedding Music :. Hi Bruno, we would just like to send a huge "thank you" from both of us for making our day extra special. All of our guests commented on how brilliant you and the other musicians were. We did have an amazing night and Virginia and the band were excellent! They were also very friendly and happy people! Thank you Bruno for all your help! We just wanted to say again how great it was to have you as our wedding band, we truly had a great time. Our deepest gratitude. 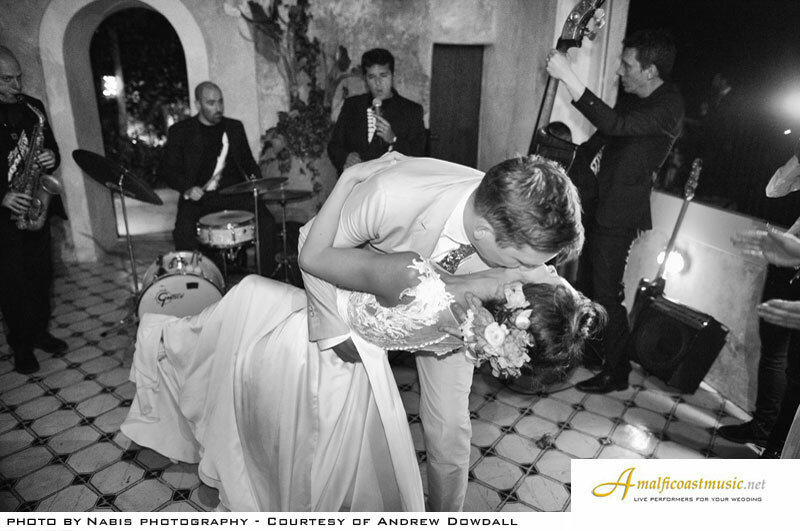 How to book live performers, bands and DJs for your wedding in Amalfi, Ravello, Positano, Praiano, Sorrento and Capri in Italy. Assistance choosing your music for ceremony, cocktail hour, reception, including strings, harp, Jazz and POP-Rock bands, DJs. 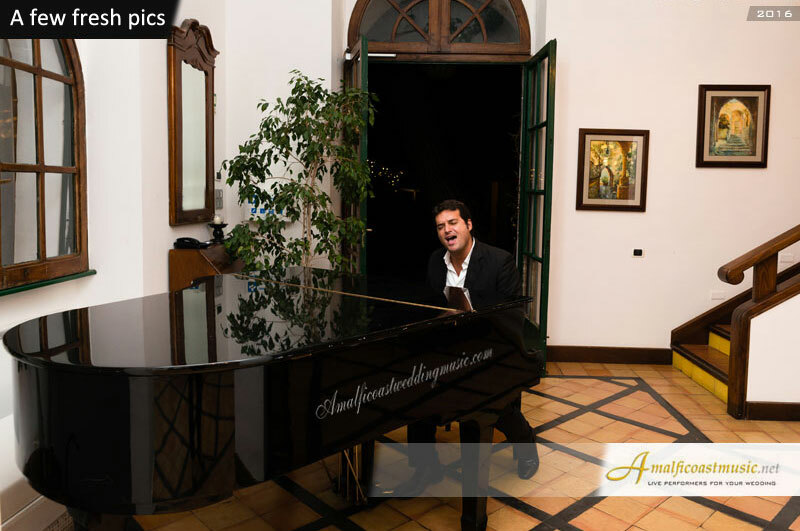 Find professional musicians for your wedding, also available in Rome, Tuscany and Lake Como. Live music in Ravello, Sorrento and Capri, Italy. English and American Bands.